Since the Hobbit film trilogy began shooting principal photography 18 months ago, the production has played its very cards close to its chest, and Stone Street Studios has proved more leak-proof than the White House. In light of this, speculation on the films — whether pertaining to structure or content — has the hallmark of paleolithic archaeology: not only are large inferences having to be made from an extremely small amount of evidence, but the legitimacy and relevance of the evidence itself is by no means certain. 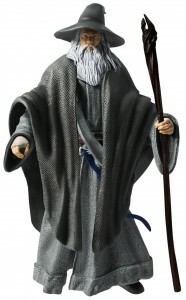 With all this in mind, I’ll try and draw some tentative conclusions about the trilogy’s plot and structure — with particular attention to any evidence of departures from the book — from what we understand to be official biographical notes that will accompany the character figurines from The Hobbit. While it is impossible to confirm that the descriptive information released with these figurines accurately reflects the film-makers vision, they are detailed and idiosyncratic enough to suggest there is a high degree of alignment. Note that some of the biographies (Kili, Fili, Gloin and Dwalin, for example) are left out here. Where this occurs this is because, in my view, they offered no insight on the trilogy plot, structure, or departures from the source material. And if spoilers and speculation aren’t your thing, best to stop reading now. ‘Gandalf finds an indication that the world could be haunted by an ancient evil’ suggests, at the very least, that he comes across the Morgul blade (the ‘indication’), as shown in the footage at Cinema-Con in April, somewhere between Hobbiton and Rivendell. 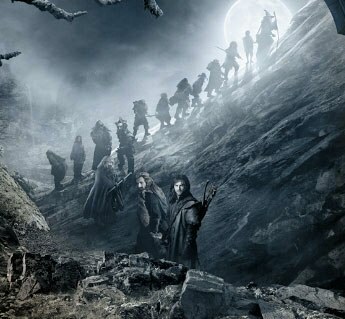 It therefore seems plausible that the film will have the Dwarves pass through the Barrow-downs on their way between Hobbiton and the Trollshaws. 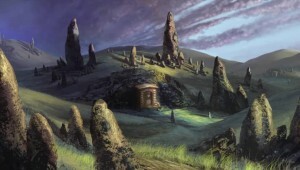 This would mean including in the Hobbit a scene that was left out of the Fellowship of the Ring (FotR) film. Doing this would not be unprecedented: Jackson has a track record of moving scenes and dialogue in, and between, films in the Lord of the Rings (LotR) trilogy. For instance, Old Man Willow appeared in The Two Towers (TTT) instead of FotR. In Tolkien’s world, the Barrow-downs — located east of the Shire, but west of Bree — are places where the ancestors of the Edain (the three great Houses of Men that constitute the Dunedain) were buried long ago. The Witch King of Angmar (who later became the head of the Nazgul/ black riders) later sent evil spirits, called wights, to inhabit the barrows. In FotR, the four hobbits are trapped by these spirits in the Barrow-downs mists before being rescued by Tom Bombadil. What is likely to therefore happen is this: the Company will travel through the Barrow-downs on their way from Hobbiton to the Trollshaws, and become trapped in the same manner as the Hobbits in FotR. Gandalf will likely rescue them, instead of Tom Bombadil. However, while they are there, Gandalf comes across a broken crypt, and in it the Morgul blade (in the FotR book, the Hobbits each take Dunedain blades from the barrow in which they are held by the wights). The writers could therefore be planning to turn the Barrow-downs from the burial site of the Dunedain that was infested with evil spirits sent by the Witch-King, to instead be the place where the Dunedain had entombed the Witch-King long ago. Gandalf finds the tomb broken, and thus he is alerted to an evil haunting the world, which leads to the discussion of the Morgul blade at Rivendell during the meeting of the White Council. From a pacing perspective, including the Barrow-downs scene here would be a good addition to the Hobbit, as in the book basically nothing happens between leaving Hobbiton to arriving at the Trollshaws. Bear in mind this is roughly the same journey as taken by the Hobbits in FotR, but in that film they passed through farmland, the ferry, Bree, the Midgewater Marshes and Weathertop. Jackson therefore has the challenge of indicating the journey is still that far and on the same route without the journey feeling repetitive. This means they may have to travel through the Old Forest, the Barrow-downs to give a sense of the journey being arduous and long. I’d wager that Bree itself might get a cameo, as a nod to the appendices, in which Tolkien writes that the Quest for Erebor is hatched through a fortuitous meeting between Gandalf and Thorin in the Prancing Pony, a meeting that ultimately leads to the formation of the Company some time later. This description suggests that we might well get some flashbacks of the hardship the dwarves endured in the Blue Mountains and as itinerant smiths following the loss of the Lonely Mountain to Smaug. 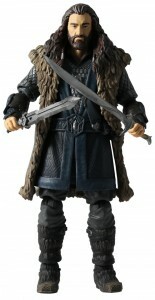 It is unlikely that Thorin will reveal his background of hardship himself, as he is a proud dwarf. It is therefore most likely that his backstory will be revealed in two ways. First, other dwarves in the company will reveal it to Bilbo, no doubt out of ear-shot of a brooding Thorin. This will perhaps occur on the journey to Rivendell, as the first part of the film will of course have to set up the rest of the film and trilogy. Second, it could be revealed via a dream sequence for Thorin. If this occurs, it will likely be used to begin film three, There and Back Again, much as RotK began with such a sequence for Gollum. The sequence could open from the perspective of a young Thorin, leading a band of other young, foolhardy dwarves, being mischievous in Erebor, gleaming in all its pre-desolation splendour. The camera then follows them through the great halls, bustling with industry, commerce, culture, and then out through the front gate onto the side of the Lonely Mountain. Thorin and his comrades scramble up the mountainside, perhaps hunting, and while joking amongst themselves, Thorin suddenly sights something on the horizon, high against the sky. Slowly, as it gets closer, Thorin begins to feel a sense of horror and dread creep over him. It is the coming of the dragon. He watches, helpless, as Smaug descends on the mountain, smashing through the front gate. 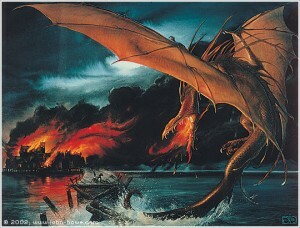 The sequence then picks up pace, quickly cutting to scenes of slaughter as Smaug routs the Kingdom, laying Erebor to waste: scenes of him scything through battalions of Dwarves forlornly scrambling to defend their Kingdom; rampaging through the halls and darting under arches, smoking out those in hiding; driving all before him. The sequence could build to a terrible crescendo of death and destruction, fire and flashing talons, and suddenly the dragon turns and seems to breathe fire straight into the camera… and Thorin wakes up with a start. It was all a dream. A recollection of what befell the mountain all those decades before. Thorin looks around, and finds himself sitting in the ruins of one of the great halls of Erebor. Having been there several weeks, the dwarves are now somewhat settled into the sorry remains of their old kingdom. Thorin slowly stands up, and the camera pulls back to reveal the charred halls, the great doors broken from their hinges. It still has the reek of Smaug. Sloughed dragon skin is all about, coiled in corners, draped over ancient beheaded statues of dead Kings like some hideous gossamer. Such a ‘dream sequence’ would play an important role at the beginning of the third film: it would establish, aside from Bilbo himself, Thorin as the central character of that film, as the film will follow his arc from a descent into despotism through to his reconciliation with Bilbo and redemption in death. The scene will remind the audience of why he is unwilling to parley with the Lakemen, and why he proves so covetous of his Kingdom, terrified of losing it all over again. It establishes the tragedy and humiliation that defines him, and which hardens his resolve into obstinance now he is re-ensconced in his ancestral halls. It would also illustrate the tragic decline of the kingdom from its glory days before the coming of the dragon, compared to its ruin now it has been retaken: it shows what the dragon has wrought. This scene would also allows the director to begin film three with a high-octane action sequence, one that would have the added benefit of giving Smaug some more screen time, even though he will have been killed at the end of the previous film. For these scenes of Smaug’s conquest of the mountain could not have been shown in much detail at the beginning of the first film, in Hobbiton, as what Smaug looks like is likely to be the big ‘reveal’ of film two, and thus little of him will be shown in film one. Such an action sequence will be necessary as the rest of the first act of film three will largely be about diplomacy and the drum-beats of war, culminating in the Battle of the Five Armies.